Just one day after India’s power grid left 370 million residents of its northern provinces without electricity, the country is experiencing another massive crash of their fragile power grid with some 600 million people – about half its entire population – now going through widespread outages in what can only be described as a cascading power grid failure. Though no cause has yet been identified, the power ministry is frantically working to restore electricity as essential services collapse and transportation systems come to a grinding halt. Hundreds of thousands have been trapped in mid transport on trains, while millions sit in traffic jams across afflicted areas. About 600 million people lost power in India on Tuesday when the country’s northern and eastern electricity grids failed, crippling the country for a second consecutive day. 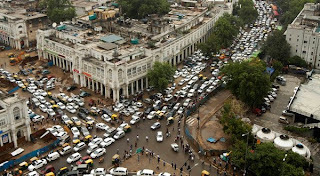 The outage stopped hundreds of trains in their tracks, darkened traffic lights, shuttered the Delhi Metro and left nearly everyone — the police, water utilities, private businesses and citizens — without electricity. About half of India’s population of 1.2 billion people was without power. India’s unofficial power grid, a huge number of backup diesel generators and other private power sources, kept hospitals electrified and major airports running. Manoranjan Kumar, an economic adviser with the Ministry of Power, said in a telephone interview that the grids had failed and that the ministry was working to figure out the source of the problem. Northern India’s power grid crashed Monday, halting trains, forcing hospitals and airports onto backup power and providing a dark reminder of the nation’s inability to feed a growing hunger for energy as it strives to become an economic power. Some small businesses were forced to shut for the day. 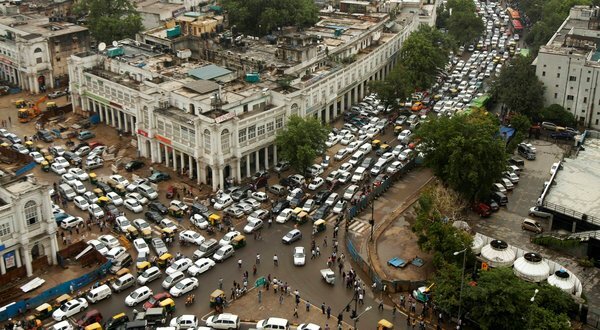 Buildings were without water because the pumps weren’t working, and the vaunted New Delhi Metro, with 1.8 million daily riders, was paralyzed during the busy morning commute. Power Minister Sushil Kumar Shinde deflected criticism, pointing out that the United States and Brazil also had huge power failures in recent years. “I ask you to look at the power situation in other countries as well,” he said. A large portion of India’s population regularly operates without electricity – either because they are too poor to have lines installed, or due to regular power outages. The power in this particular instance was restored to the majority of areas within 12 hours, but demonstrates that the Indian grid, as well as those around the rest of the world, could stop pumping electricity at any time. Consider how India’s populace would have reacted had the grid gone down for several days, or weeks, without repair. India’s grid crash is reportedly a result of excessive energy demand, and thus service was much easier to restore than, say, if there had been a natural disaster or attack focused on the utility infrastructure (from someone like neighboring Pakistan – who, incidentally, probably just got a great idea). In any case, what we can learn from this is that even in a country of one billion people, there are critical infrastructure issues that have been left unaddressed. The power grid in the United States, while more advanced and apparently better maintained, is also under excessive strain as has been witnessed in recent years with rolling brownouts, blackouts, and unforeseen crashes resulting from key component failure. One industry insider who has worked in the utility industry for nearly two decades advised this author recently that it wouldn’t take much to bring down the system even in the United States, potentially affecting tens of millions of customers. Though it’s the 21st century, many grid components in operation are, in some cases, as much as 40 years old, thus replacement parts are almost impossible to find. Other components, like massive transformers may take weeks or months to replace. In the event of a scenario where multiple components are targeted simultaneously, by either a man-made EMP or natural event, it is not too far of a stretch to suggest that the afflicted regions would be engulfed in pandemonium. After Hurricane Ike passed through the Houston area 2008 some 90% of the metropolitan was without power. While hospitals, police and critical infrastructure was restored within a few days, residents in outlying suburban areas experienced the outage for over three weeks. We witnessed the rapid loss of patience, increased anxiety and frustration, and the subsequent breakdown of interpersonal interaction at high-demand venues such as gas stations, where long lines, screaming matches and even fist fights became a common occurrence. The bottom line: As demonstrated in India today, Quebec in 1989 (caused by a geo-magnetic storm originating from the sun), Ike in 2008, Hurricane Irene on the East coast in 2012 and the plethora of incidents that have taken place over the last couple of decades, the North American power grid, just as India’s, is susceptible to far-from-equilibrium situations, and sometimes it takes extended periods of time to get power up and running. With just three major grids running the United States, our dependence on massive flows of electricity to power our home air conditioners, food refrigeration, communications, water and gas pump systems, and daily business operations could come to a screeching halt should the grid ever be struck by a natural disaster like a solar coronal mass ejection or a large-scale earthquake in California or on the Madrid fault. Likewise, as we’ve noted previously, rogue organizations looking to wreak havoc have already demonstrated the staggering security holes in our power, water and oil grid infrastructure, with leading cyber security firms noting that it is just a matter of time before disaster strikes. While a short-term, isolated metropolitan outage can be dealt with by sourcing labor and supplies from unaffected areas of the country, considering that the US operates on three key power grid systems, a region-wide outage affecting just one of these nodes could lead to a cascading breakdown in the electrical power system that envelops the entire country. The most dangerous possibility emerges when we look at threats posed by the sun or a rogue terror cell or nation that could deploy an Electro-Magnetic Pulse weapon (EMP / Super EMP) over American skies. It’s been surmised that either one of these possibilities could cause damage so staggering that the grid would be down for months, leaving millions without just-in-time food and gas delivery systems, medical care, local emergency response, or even clean water. According to one estimate, some 90% of Americans would die in such a scenario if the power wasn’t restored within one year. Thus, it is clear that our power grids are a critical lifeline to keeping life as we know it in the world today operational. And, as we have seen historically and India this morning, power grids can and do crash – even in countries with hundreds of millions of residents. Though a nationwide long-term power grid failure in the United States is an unlikely low-probability event, were it to occur it would literally change the face of the world as we know it.